KINGSTON, Jamaica (JIS) -- The government of Jamaica has signed a framework agreement with China Harbour Engineering Company (CHEC) for the development of a transshipment hub in the Portland Bight. 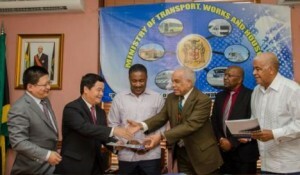 Speaking at the signing ceremony on March 28, portfolio minister, Dr Omar Davies, emphasized that all regulations will be adhered to in the “normal way”. “We treasure the preservation of the environment, as much as any other group, and we are concerned about the human beings and the plight of poverty, and the impact which that has on the environment,” the minister said. The proposed transshipment hub, which is part of the logistics hub initiative, is expected to create 2,000 jobs during the construction phase, and 10,000 jobs when the project is fully implemented. Davies argued that a project which does not harm the environment, and will improve people’s living standards, must be explored. “After all the required studies are carried out, including the environmental assessment, this project will be going ahead,” he said. “If we can find a project which provides productive employment for our citizens…and at the same time restricts any damage, then we have a win win situation,” the minister argued. With the assistance of the Port Authority of Jamaica (PAJ), CHEC has made moves to engage the National Environment and Planning Agency (NEPA) in its feasibility study of the project. Once the economic benefits are clearly void of environmental harm, implementation will begin, and “in China Harbour, we have a trustworthy partner,” Davies said.